Stamping is one processing method for metal. In this method, a metal mold (called a die), which consists of a top part and a bottom part, needs to be provided. Insert a metal plate between them and apply pressure, and cut the plate in due form. In principle, it is the same method as cutting the dough into a shape using a cookie cutter. To start with, you will need to create a die. However, once the die has been created, large quantities of components may be created using the same die. 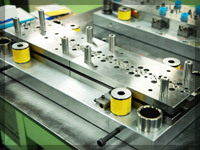 Therefore, stamping is considered to be a process suitable for mass production. There are various methods of processing the dies other than the stamping. In general, the metal processing methods are classified into four types as below. A method in which a blade is applied to the solid metal blank to cut or drill a hole through it. Stamping machines for cutting process are usually used. In this process, a die is pressed into a plate of the metal to cut. Stamping machines are used. The molten metal is poured into the mold in this method. Also called 'foundry.' This method has been used to make Buddha statue or bell since early times. A method in which a metal in the form of a powder and an adhesive are mixed together and then baked in a mold. Since the metal used is in a powder form, it proves advantageous for the processing of alloys (formed from mixing various metals). Even though all these methods are called stamping, there are various processing methods included in it. A processing method in which a metal plate is processed into a product by applying pressure. As the name suggests, a processing method in which a part is pulled out from a metal plate which then becomes a product. A processing method in which a metal is bent. There are various methods of bending such as a sharp bend, a round bend, etc. Crushing generally means a forging process. In the case of simple forging processing, when the pressure is applied, the excess metal will continue to escape to the outside. However, the integrated molding technology of our company is an exclusive process in which molding is accomplished without the metal chunks escaping to the outside. The integrated molding enables the effective use of the material and it also enables stereoscopic processing. Stamping generally indicates steps such as 'squeeze', 'pinch' and 'bend;' however, our company has incorporated the technology of 'crush.' The '3-dimensional molding technology' is achieved by incorporating the 'crush' technology wherein the metal can be handled as easily as clay can be, and even the most complex shapes can be processed. When we are discussing the stamping process, invariably the discussion will lead to the dies. It would not be an exaggeration if the die were to be described as the 'life' of the stamping. The precision of the die very much decides the quality of the product in the end. As discussed in the beginning, the die consists of a top part and a bottom part. The parts are combined together, a metal plate is inserted in between the gap, and pressure is applied. A die consists of a few hundred to a few thousand parts, thus making it an extremely complex component. The manufacture of a die is a matter of particular technical skill. For example, if a circular-shaped product is to be manufactured, simply making the circular-shaped die isn't going to result in a product. If the stress generated during the process is not taken into consideration while designing the die, the circular-shaped product cannot be manufactured. For the force which pushes back during stamping (stress) is enough to ruin the product if proper technical skill is not present. Cost for the cheaper dies ranges somewhere in between 20,000 to 30,000 Yen, whereas for the normal items, the cost is around a few million Yen. There are also items with the cost around tens of millions of Yen. Generally, there are professionals who make the die and the stamping manufacturers place the order for the dies with these die manufacturers. However, Gotos has the necessary facilities and the technical know-how for manufacturing dies for your company, and we carry out all the activities from designing to die manufacturing. Accordingly, we can cope with sudden design changes with ease. Since we are constantly updating the mold technology, we have managed to achieve a level of processing which was believed to be impossible in conventional stamping. The foremost difficulty in die design is that the process has so many subdivisions. If we try to process the metal plate all at a once into the desired shape, an unforeseen force is generated in the metal and the molding cannot be carried out. Therefore, the process is carried out step-by-step until the desired shape is obtained. 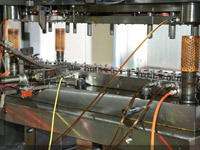 If it is a complex item, ten steps or more may be required for manufacturing a single product. In other words, ten or more different dies may be pressed in the manufacture of a single product. Actually, a single die is designed in such a way that the processes from step 1 to step 10 are pressed sequentially. The design process requires rich knowledge and experience. In the stamping, if the stamping machine is operated by setting the die and the material, we can manufacture the same product again and again with high precision. When the machine is running smoothly, the operators can leave their place near the machine and move around. However, difficulties do arise in the steps before the machine begins smooth operation. For example, the outcome of a product can be different depending on the warming of the stamping machine. We manufacture the products with micron unit precision; however, the feed widths of the material when the machine is not warm and when it is warm may differ slightly. When 'continuous coining processing technology', where all the processes are sequential, is carried out, even a slight gap can turn into a bigger gap at the end, which may affect the quality severely. The temperature and the humidity can also affect the process, as can the quantity of the machine oil used. It is not just about setting up and pressing the button. Without the fine tuning, a product with high precision will not be obtained.